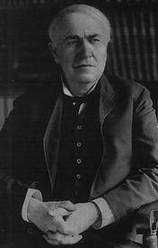 "The great trouble is that the preachers get the children from six to seven years of age and then it is almost impossible to do anything with them." 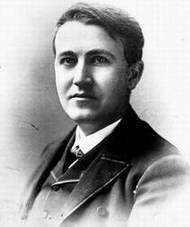 quoted by Joseph Lewis from a personal conversation: see "A Visit With Thomas Alva Edison"
quoted by Joseph Lewis from a personal conversation, in "A Visit With Thomas Alva Edison"
"I cannot believe in the immortality of the soul. ... No, all this talk of an existence for us, as individuals, beyond the grave is wrong. It is born of our tenacity of life — our desire to go on living — our dread of coming to an end as individuals. I do not dread it, though. Personally, I cannot see any use of a future life." interview in The New York Times (October 2, 1910) front of Magazine Section, by Edward Marshall. "I have never seen the slightest scientific proof of the religious theories of heaven and hell, of future life for individuals, or of a personal God. ... I work on certain lines that might be called, perhaps, mechanical. ... Proof! Proof! That is what I have always been after. I do not know the soul, I know the mind. If there is really any soul, I have found no evidence of it in my investigations. ... I do not believe in the God of the theologians; but that there is a Supreme Intelligence, I do not doubt."